Hello! We are having some beautiful weather here in Wisconsin. It is going to be in the fifties all week! Soon the awful white (or grey) stuff will be a distant memory. The birds are singing, the sun is shining, and I'm even starting to see grass! To say my mood has been elevated because of the weather would be an understatement. Hooray! Spring is coming. In my last post I showed you a cheerful spring card for a female, today I have a masculine warmer-weather card for you! To make the card, I started with a sketch by Splitcoaststampers (SC321). It was perfect to use with my K & Co epoxy stickers. 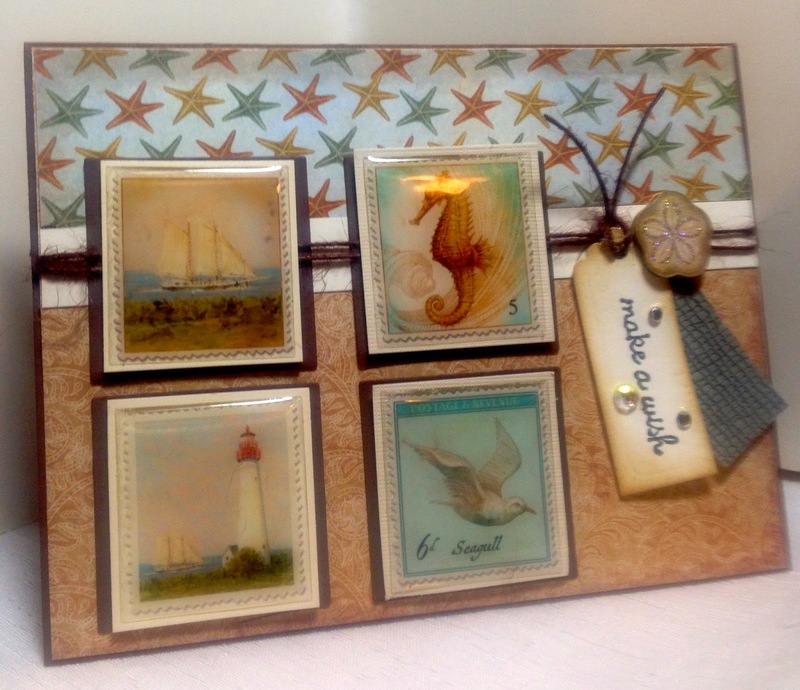 I used Nesties to cut out off-white and chocolate brown squares to place behind the stickers. 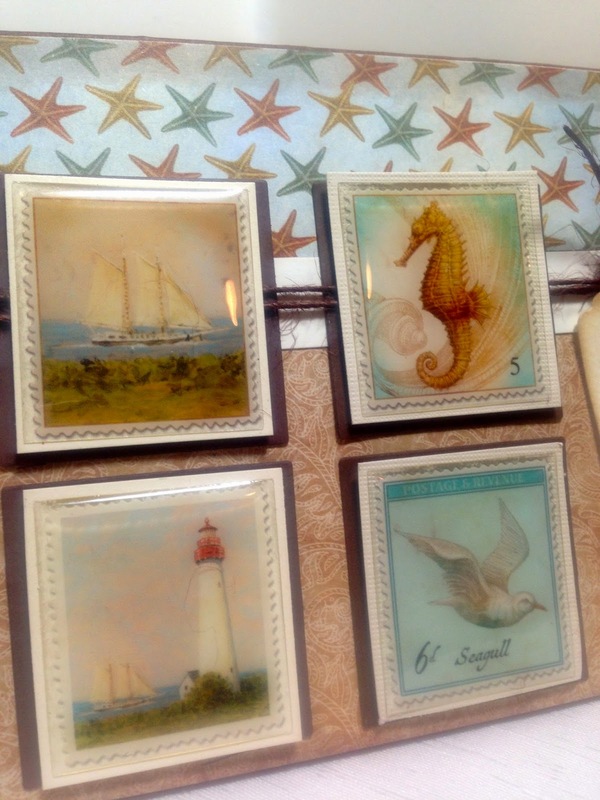 My sea-themed paper is by Tim Coffey, and is also sold through K & Co. 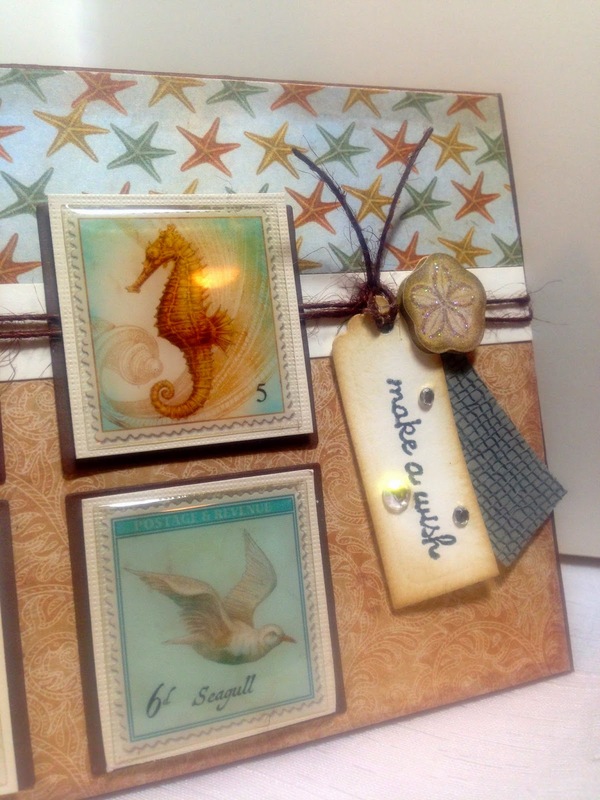 I made a sentiment tag using my Spellbinder's Nestabilities. I inked the edges and added a few rhinestones for embellishment. I also made a second sentiment rage using a textured paper from DCWV just for extra fun. The little sand dollar embellishment was part of the K & Co sticker kit. Hemp was strung around the card to add that rustic touch guys love and also to hang my tag. 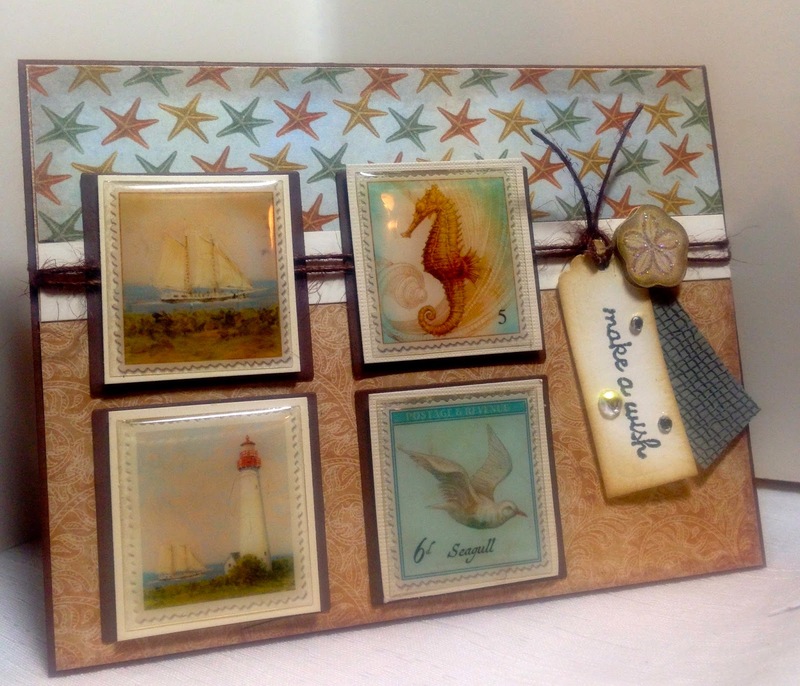 The stickers and papers have been in my stash forever so I'm not sure they are still available, however, you could re-create the design using any other sea-themed stamps, stickers, or papers. Well I hope you all are getting some warmer temperatures wherever you live. We sure did have a much more pleasant winter than we did last year, although I am aware that the rest of the country has had a worse one. Hello! Happy Monday to you!! I, too am excited about this warmer weather! Which part of Wisconsin are you from? I am also from Wisconsin. I live in the Racine area near Milwaukee. Wonderful sea-themed masculine card. Great design. I love those epoxy stickers and papers you've chose. Have an awesome day! Amy ! This is a WONDERFUL card !!!!! Wow!! This is beautiful Amy!! Fantastic masculine card. Love those stickers! We've been having some nice weather here too, and our snow is almost gone too!